Among the Transformers Prime Autobots, the only character I haven't bought a toy for is... Optimus Prime! I guess I knew there will definitely be more versions and repaints released in the future, and was waiting for one that will really wow me. When I had the opportunity to buy the Weaponizer version at "cheaper than retail even after 20% discount" price, I jumped at the chance to finally own a TF Prime... erm, Prime! Size-wise, Weaponizer Optimus is bigger than Voyager class and just slightly shorter than Leader class. He is actually quite poseable. Too bad the gun that comes with him is crap. Guess I'd have to look for third-party ones. The Weaponizer feature of Optimus Prime is the two multi-barrel shoulder cannons. But they don't seem enough. So I added the Perfect Effect PX-04 weapons to beef him up. Behold, Weaponizer 'Heavyarms' custom! I like the front of this truck mode, up to the cab. The back of the truck, however, is a mess! Weaponized truck mode, with the guns from DA-28 Striker Optimus mounted at the side. The deploying multi-barrel cannons from the front reminds me of M.A.S.K. 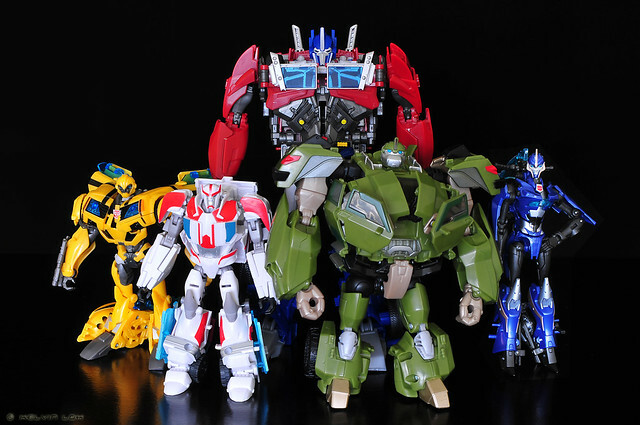 Transformers Prime Autobots. I thought Weaponizer Optimus would be better scale with the other TFP Autobots. But turns out he is too big. So is Weaponizer Optimus the best version of TFP Optimus? Most folks will say FE (First Edition) Optimus is the best currently. I'm most disappointed with the amount of kibble left visible in truck mode. Maybe some third-party company will come out with some stuff (cough trailer cough) to hide them.